St George’s church has played a significant role in the community and town of Newcastle- under-Lyme since its creation in 1828. Originally built as a chapel of ease to St Giles Church, St George’s grew exponentially becoming its own parish, creating schools and planting other churches locally. Throughout the years, St George’s has been a lifeline and place of safety in the community. During the early 1800’s the local population grew substantially and in response to the need, St George’s provided meals, coal and clothes to the poor in the parish. It also established a Bible and domestic mission group to help the local area alongside evening sewing and adult literacy classes, a leading library, a shoe fund and much more for the poor in the area. During the wars of the twentieth century it provided a place of hope. Many of the locals served in the war efforts, a memorial can still be found in the church today. During WW2 the church crypt was also used as an air raid shelter and you can still see the painted signs on the walls to this day! Designed by Francis Bedford in a commissioners gothic revival style, the church was different in its conception, designed to be able to fit many people in at less of a cost than some of the other churches that had been built locally. It was initially built very simply and quickly, with the foundation stone being laid on the 6th of July 1827 and the church being officially opened on the 16th of September 1828. As a chapel of ease, St George’s first vicar was the Reverend Clement Leigh. Rev'd Leigh had been a curate in Newcastle since 1803, and became the rector of St Giles in 1816 and thus of St George’s at its creation. Clement Leigh served as the rector until his death in 1853 with the following vicars of St George’s being Rev'd Thomas J Crackelt, Rev'd John Wright and Rev'd John Samuel Broad. Although the church was still involved with St Giles, the vicars of St George’s involved themselves in the town and the life in Newcastle, applying for grants to create local schools, working with the local Literary and Scientific Institute and dealing with the affects of the outbreaks of disease in the parish. In 1832 and 1849 there were large cholera outbreaks in the town, many of those deceased were buried in the churchyard of St. George’s. In 1875 Rev’d Richard Ward took over as the vicar and during his time St George’s, opened mission rooms in George street, York Street, Stoke Road, Ashfields and The Green. It planted and grew St John’s Church for up to 300 people, it grew the church Sunday school and acquired the land to build St Paul’s Church (although the church was not built until 1908). Whilst Rev'd Ward was leading St.George’s, the church also underwent major remodelling and building works with new porches being created, interior restructuring and repair work to the tower being done, many of the windows that you still see in the church were gifted to the church at this time. The organ was also installed and the church laid with Minton tiles. The first national school was built during this time in a joint work between St George’s and St. Giles, with the congregation of St George’s raising the majority of the funds. When St George’s became its own parish in 1844, Rev’d John Samuel Broad became the full time vicar. Rev Broad served the church from 1840 until 1875 and during this time there was much change in the landscape of Newcastle. The church played its part in in many ways, most importantly in 1855 by creating a free school on Liverpool Road, this was part of the long link that the church had with improving the education of those in the area. The next few years saw the new century begin and more work done in the church. Rev'd O’Connor, Rev'd Baines, Rev'd Sinker and Rev'd Birch continued to build the growing community at St George’s and saw a time of great revival in the church. 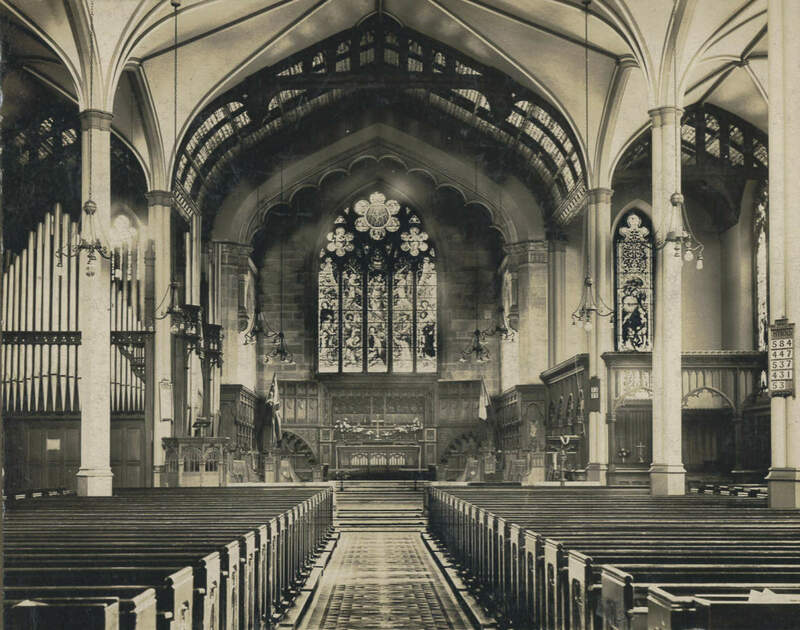 Throughout the early 1900’s more building work was done to create the raised chancel and a beautiful oak reredos of the last supper was installed. This period also saw the opening of St John’s School (the 3rd school that the church had helped to establish) and the installation of electric lighting in the church! The 1950’s brought the switch from coal to an oil boiler and more repairs and work being done in the church. Later the building of St George’s Church Centre took place and is still a very active addition to the church. During the past 7 years under our current vicar, Rev’d Martin Ball, St George’s has once again seen changes within the building itself with the addition of toilets, a modern kitchen, kids facilities and hospitality area. We hold many annual events for the local community and are so excited for all God has in store for St George’s and our local area. We are so grateful for all those who have gone before us and left such an amazing legacy of care for the community and vision to see it changed for the glory of God.